Castor's Ryan Evans is stumped by Tim Starmer of Ufford Park after making 27. Photo: David Lowndes. There was an unlikely hero as Ufford Park beat Castor by four wickets in the big Cambs Division Two derby yesterday (July 1). The match was billed as the battle between the top run scorer in the division (Ross Keymer, Ufford) and the leading wicket-taker (Stuart Dockerill, Castor), but instead Joe Harrington stole all the thunder. Will Jex hits out for Castor against Ufford Park. Photo; David Lowndes. Keymer was dismissed for a duck by Joe Higgins as Ufford set off in pursuit of Castor’s 192-9 at the start of a slump to 18-3 and 41-4. But Harrington, who had scored just 37 runs in the league before this game, came to the rescue with an innings of 87 not out that included 11 fours and four sixes. Harrington was well supported early on his knock by Tas Ahmed (25) and Tanvir Hussain (20) before Wahid Javed (28no) joined him in an unbroken seventh-wicket stand of 152. Dockerill managed just one early wicket. Ufford are fourth in a very competitive division, while Castor are down to sixth. Tanvir Hussain of Ufford Park takes a caught and bowled opportunity to dismiss Castor's Joe Higgins. Photo: David Lowndes. The top three all won in Division One, but Wisbech move above Ramsey into second place by virtue of collecting the five extra points available for bowling a team out. But Ketton continue to disappear into the distance after making it 10 wins from 10 matches with a tight two-wicket success over reigning champions Foxton at Pit Lane. They almost stumbled though. When skipper Rob Vitas was dismissed Ketton were 122-8 chasing 166, but Zeeshan Manzoor (56no) and Iresh Saxena (7no) added 47 for the ninth wicket to extend Ketton’s lead to 42 points. Foxton also conceded a decisive 61 in extras. Manzoor scored 79 not out against the same opposition the week before (June 24). Joe Higgins on his way to 15 for Castor against Ufford Park. Photo: David Lowndes. Wisbech are next up at Pit Lane for Ketton (July 8, 12.30pm). They crushed Histon by seven wickets yesterday, while Ramsey were winning by six wickets at bottom club St Ives. 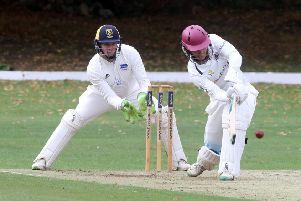 Mohomad Shifran (5-29) and Dan Robinson (49) starred as Nassington beat Godmanchester by 65 runs to make it four wins in a row, while March continue to hover just outside the drop zone after a four-wicket defeat at Eaton Socon for whom Matthew Taylor bagged a late hat-trick. March 169 (B. Phillips 48, M. Taylor 5-22). Eaton Socon 173-6 (D. Van Der Merwe 55, S. Clarke 3-22). Nassington 179 (D. Robinson 49, A. Laud 23, T. Norman 22, D. Bandarnaike 21, A. Gupta 3-36). Godmanchester 114 (M. Shiffran 5-29, A. Morris 2-18, C. Craig 2-25). Foxton 166 (D. Brown 55, M. Milner 3-24, S. Mahmood 3-49, T. Sole 2-32). Ketton 169-8 (Z. Manzoor 56no, J. Coleman 3-22, L. Lofts 3-23). Histon 107-6 (W. Brown 36, K. Haynes 2-17, P. Patel 2-18, P. Edgeller 2-24, B. Ellis 2-31). Wisbech 110-3 (G. Freear 41, J. Bowers 31no). Castor 192-9 (A. Steels 33, R. Smith 32, C. Dockerill 27, R. Evans 27, T. Hussain 3-20, R. Keymer 2-27). Ufford Park 196-6 (J. Harrington 87no, W. Jaced 28no, T. Ahmed 25, T. Hussain 20. J. Higgins 2-31, R. Evans 2-39).